Click Templates in the left sidebar. 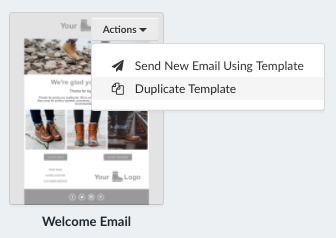 Choose any of the Featured Templates > Duplicate Template to edit them, or click + New Email Template to design your own from scratch. Create one template or a set, depending on how many steps you want your welcome series to include. Now that you have your welcome series template(s), you're ready to set up your email journey. You're finished! Your new subscribers will receive an email or series of emails from you when they sign up for your list. Need some tips? This blog post outlines everything you should be thinking of when crafting your welcome series: Step-By-Step Guide to Creating A Welcome Series.